Mount Etna, on the Italian Island of Sicily, is Europes tallest volcano (3326m) its most active and is a popular volcano adventure. Mt Etna measures 140km around its base and its lava fields dominate Eastern Sicily.It has been for active for 500,000 years and produces spectaular eruptions of basaltic lava. 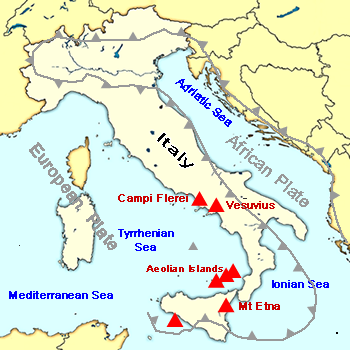 Etna lies near the subduction zone boundary of two tectonic plates ( European and African) This type of boundary would usually cause explosive and violent ash cloud eruptions like Vesuvius and the Aeolian Islands. However, unlike the neighbouring Aeolain Islands the activity is more like Hawaii, with basaltic lava flows and fountains. So its origins remain a geological puzzle but the lava certainly comes from a direct route from the mantle probably due to extension on the overlying plate rather than the accepted magma generation process caused by a subduction zone. The basalt which is erupted in spectacular fountains and lava flows is certainly not typical of a subduction zone. Etna started forming 500,000 years ago on the floor of the Mediterranean sea and emerged from the sea, with Sicily, around 100,000 years ago. The summit area has 3 craters , The central crater ( encompasses La Voragine/Chasm and Bocca Nuove), the NE Crater and the SE Crater. The SE crater has produced the most spectacular eruptions or paroxysms of in the last 10 years. 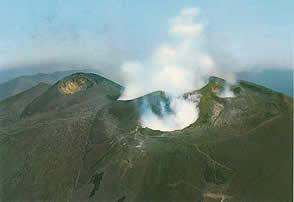 There are numerous parasitic cones and vents over Etnas slopes and eruptions are not exclusively from the crater area. On the eastern side of Etna is the Valle de bove a 5km wide valley or scoop down which many of Etnas summit lava flows tavel. The main rock type erupted is basalt a molten rock sourced from the earths mantle which has a temperature of around 800 C when molten. It forms two types of lava flow "aa aa" slow moving and very rough and "pahoehoe" or ropey lava which moves in smoother manner. 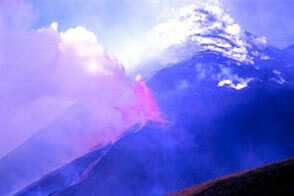 Etna can also produce fire fountains of lava 100s of metres high and large quantites of tephra and bombs. The population of Eastern Sicily have a love hate relationship with their volcano. Etna provides wonderfully fertile soils for olives and grapes and slopes for skiing but it also threatens their homes with lava flows. 1669:The Nicolosi and Monte Rossi vents produced lava flows which threatened Catania and the first attempts at lava diversion were made . 1983: Sapienza threatened and attempts at lava diversion with explosives were made. The snow has largely gone from Etnas upper slopes between May and September although you will find patches. 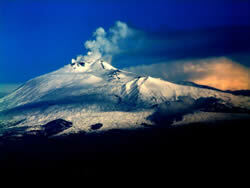 Access to Etna is usually from the south side to the top cable car station at Piccolo rifugio. Below the Rifugio Sapienza is located at 1910m and has shops and restaurants; it is the base of the cable car and easily reached by a paved road. 4WD tours often leave from the top cable car staion so check with the local tourist office or at the Rifugio Sapienza. Ascent to the summit from the north side can be arranged in Lingualossa, check the tourist office for guides and trips. 4WD trips leave from Piano Provenzana, which is recovering from the 2003 eruption and go to Piano delle Concazze, at about 2700 m.
All trips to the summit are subject to change or cancellation due to activity . To try to go without an experienced guide would be daft to say the least. The following companies provide tours and trips with experienced guides not just to the summit but to other features of interest such as lava tubes and hornitos! www.sicilyoffroad.com Only jeep hire on the island and jeep tour provider - great fun! Etnas terrain is rough under foot and sharp. A good pair of boots and gaitors area good idea as is a walking pole. Lava is sharp to sit on and can cut your legs so trousers for most of us and shorts for the most hardy .The summit area is high so be prepared to go a little slower due to altitude and pace yourself.